I’ve loved sewing for as long as I can remember. When I was seven or eight-years-old I learned to sew on a treadle sewing machine, and my first project was a nine-patch quilt. By the time I reached thirteen, I was sewing all my own clothes. 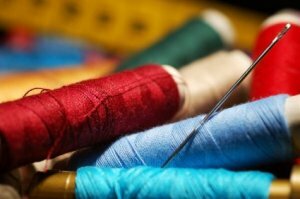 This skill served me well as a young mother because I was able to stay at home with my children while earning money by sewing for the public. In 1986 I met Peggy Gammill, one of the owners of Gammill Quilting Machines. She taught me how to make custom bedspreads and drapes. I was thrilled to learn from her and before long we were sending our custom bedspreads out to designers all over the US. I worked with Peggy until she had to close her workroom due to illness. I then continued to work for her husband at the Sewing Center until it changed owners. After that I bought a quilting machine and began offering quilting services to the public and teaching classes. I soon discovered that if I wanted to teach classes I really needed to carry fabric and notions. About the same time I realized that people in my area were driving over one hundred miles to buy Husqvarna Viking sewing machines & products or to get their machines serviced, so I decided to became a Husqvarna Viking certified dealer. As the owner of The Sewing Connection I feel very fortunate to be able to have a job that I love. I enjoy teaching my customers and seeing their sewing skills improve and their confidence bloom. I continue to do custom quilting because it’s fun and a wonderful creative outlet. Stop by our store any time and say hello.